I really don't get those straps. They seem so bulky and uncomfortable. The Buckle is gimmicky to me. They are like fat people stretch pants, they adjust to your wrist during the day. Extremely comfortable strap. Was pleasantly surprised once I had it mounted. Biggest drawback is the price imo. I'm trying to visualize how this is different from the standard setup?? Can't seem to find any pics off the website?? That really helps. I get it now. So I would want the clasp under the wrist as well. Have to specify that when ordering. 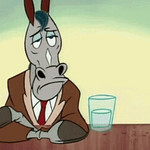 Looks like the 20mm MN won't be available till the end of the month. But I'm on a list for one of those as well. Communication with Erika was excellent!! Looking forward to receiving my straps. Looking forward to your impression of the straps. Those are some pretty nice looking straps... Going to have to keep an eye out for when she has some 20mm black straps available.. Okay, not the Black Ops MN, but I did receive a standard MN and I really dig it. Super thin, low profile strap that is really comfortable. And I now understand why the hardware is set up on the sides by Erika. It balances out to the left and right of your wrist. Plus having no hardware under the wrist makes this strap ideal for people who spend a lot of time typing. No clasp to bang around and get in the way. So if Erika has your wrist measurement, she will customize the strap in order for the hardware to sit nicely on both sides of the wrist. Looks great; good point about the hardware location. Have to agree with the comfortable side. The fastener on the side is also great when working on the laptop. Only drawbacks are the limited look (black would be great) and the 21mm sizing (OCD would hate the little pucker or gap if 20 or 22). I know some have offered 20mm, but I've seen some junky clasps and rings (laser cut but not tumbled/buffed). By profession, I'm extremely OCD. So I've been playing with and fiddling with this strap all day long. Trying to center everything and learning how to adjust the clasp ..... it's not super easy. The adjustment clasp is tight. 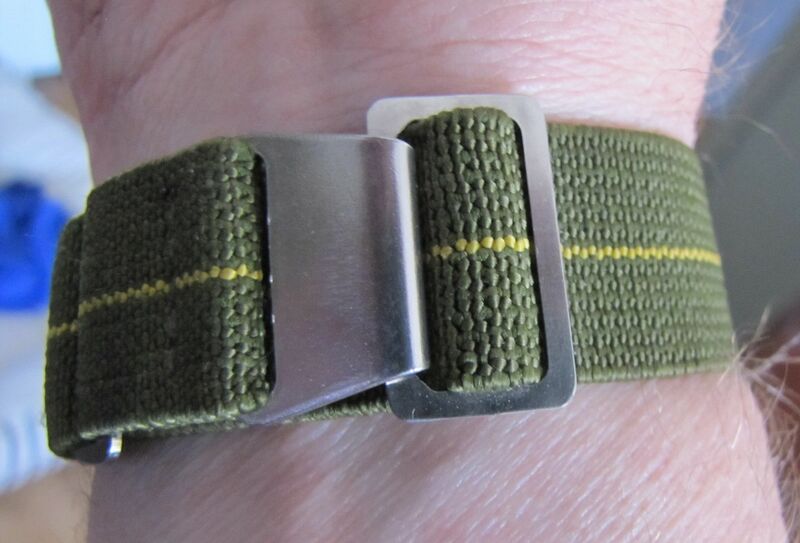 What I like about this strap, is that it's equally comfortable up on the wrist a bit or closer to the hand. Once everything is set to your liking, simply pull the watch head straight up, and the elastic kinda centers itself. Also, I can easily take the watch off and put it back on without any fiddling. Think Speidel. Very cool!! Been wearing it all day and I just forget I have a watch on. 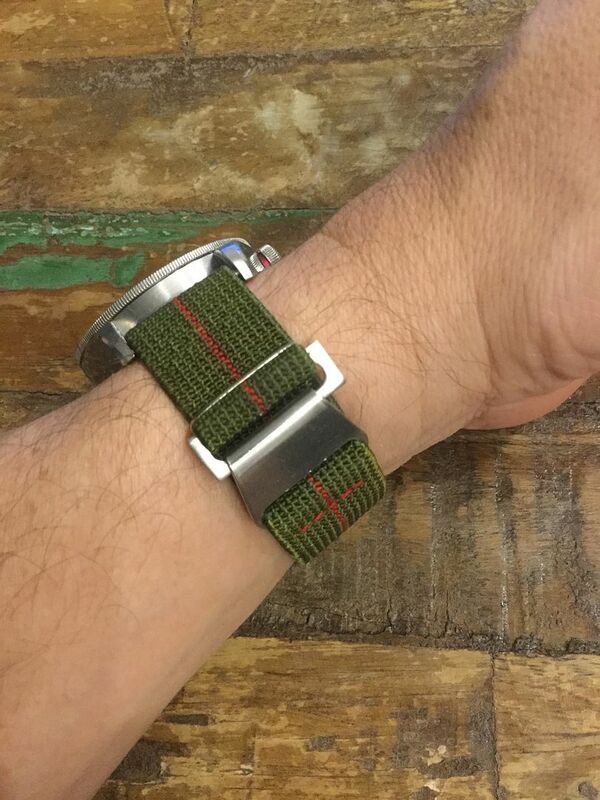 This strap was designed for a 6.75" wrist. I asked Erika to make mine for a 7" wrist, so I'm guessing the hardware will be a little more spread on my incoming strap. the 20 mm blacks can be ordered now. Last edited by 2ar2c1 on Wed May 10, 2017 6:58 pm, edited 1 time in total. I received the two I ordered already. Haven't had a chance to try them out yet. 2ar2c1 wrote: the 20 mm blacks can be ordered now. That might be nice on the EZM3F. I got three in. One with silver stitching 20mm, one with orange stitching 20mm and one with red stitching 22mm. Here is the silver (gray) on my MM300. Love it!!! Little more discrete than my regular MN. That does look pretty good. I'm considering getting a red striped one for the U1P. Does she do any in plain colors? Or you can choose the color stitching you want from a variety of colors. Last edited by skcheng on Sat May 13, 2017 3:19 pm, edited 1 time in total.